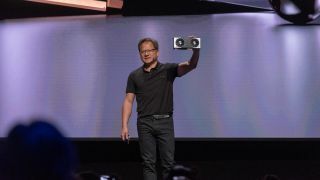 AMD only just revealed its Radeon VII graphics card at CES 2019, but its competitor Nvidia has already dismissed it as “underwhelming”. Ray tracing has been Nvidia’s big passion with its latest RTX series graphics cards, and the GPU maker unveiled the GeForce RTX 2060 at CES as well, which brings ray tracing, which is an advanced way of rendering light and shadows for more realistic graphics, to mid-range graphics cards. While we always enjoy a bit of juicy rivalry between Nvidia and AMD, Huang’s comments seem a bit premature, as it’s unlikely he’s seen the Radeon VII in action, or knows the full rundown of specs. So, is it a bit of playful banter from Huang, or does it suggest Nvidia is a bit rattled by AMD’s new graphics card? We’ll get a chance to test out the Radeon VII soon, so we’ll know just how worried Nvidia should be.